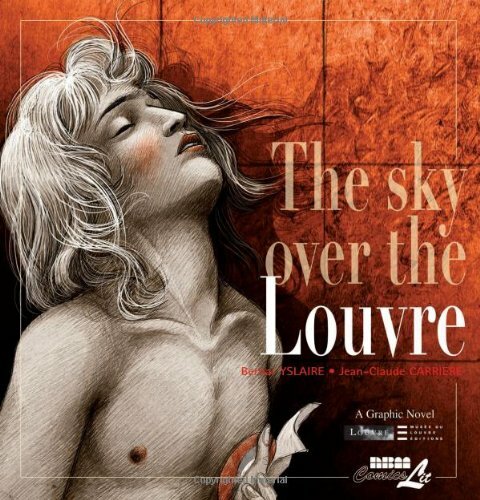 As a work of historical fiction The Sky Over the Louvre impresses with its scope and insight into the very turbulent period of the French Revolution, specifically the Reign of Terror. Told primarily through the political, artistic, and emotional point of view of Jacques-Louis David, the renowned painter and friend of Robespierre, authors Carrière and Yslaire masterfully blend sequential art, prose, and design sensibilities to give the reader an intimate look into the ideas and personalities behind this bloody period of history. Though the creators clearly have a strong understanding of the time period (and assume a certain level of understanding from the reader), perhaps the most intriguing parts of the book are in the unspoken details of history which are worked into the story and add layers of depth and texture which aren’t necessary to the plot, but instead are enjoyable little gems for the art, history, and art history buffs. David’s paintings embody the idealism of the Enlightenment but also serve a clear propaganda role for the Revolution and he uses common religious themes to depict secular subject matters, such as his reverent painting of Marat as hero and martyr of the Revolution. As the story progresses, this same dichotomy finds itself causing the schism between Danton (who stresses secularism) and Robespierre (who wants to replace religion with a more general recognition of a “Supreme Being”) who subsequently tasks his friend David to depict this impossible concept. David, at the same time, harbors an unspoken infatuation with a young handsome foreign boy named Jules Stern whose path continues to cross David’s. Jules is chosen by the painter to be the model for another martyr of the Revolution, a lad named Bara (which will become David’s Mort de Barra). David’s artistic temperament leads him to begin blurring the lines between his two commissioned works, and his obsession with Jules proves to be problematic when the boy expresses some sentiments which are construed by David’s apprentices as anti-Revolutionary. These artists subsequently report Jules to the Committee for Public Safety, a fate that typically led to a final meeting with the guillotine. It is from here David’s obsession takes a ghoulish turn when he acquires the corpse of the decapitated Jules for one final stitched together pose. The painting had long ago begun to symbolize the Revolution for David, and the creators of this book have strung together a beautiful narrative that weaves in and out of history, and through it makes a number of delightful postulations concerning the character of David; some overt, and some subtle. But it is when history begins to fill in the gaps of the book that we find the most interesting insights into the character of David. For instance, David shows in his self portrait that the left side of his face was malformed with a tumor, which he claimed came from a fencing injury (and even painted the wound), and yet Mr. Yslaire shows no such deformity in the book. As he is a well-known propagandist, this comes as little surprise and shows us David’s willingness to suspend truth for an agenda (a sentiment common throughout the book). This duplicitous behavior is also evident at the end of the Terror, when David cuts all ties to Robespierre and his party, and later changes his political affiliation in support of Napoleon, becoming his (famous) court painter. Overall the book offers an accessible look into the zeitgeist of this revolutionary period and shows great insight into its exploration of the relationship between art and politics, and the use of artifice to drive a political narrative. As the world today seems to be going through another period of revolution (while being opposed by political forces whose methodologies might remind us of people similar to Robespierre, Danton, and even David) perhaps we will come to see that these practices are hardly new (nor were they new in David’s age, for that matter) and that history time and again will repeat itself, so long as the same sorts of people claim the same sorts of power. Perhaps The Sky Over the Louvre only shows us a single page from the book of human history—but the struggles within are as old as humanity itself.